Everyone has their version of the Winter NAMM show, held this year January 23-26 at the Anaheim Convention Center in Anaheim, CA. In the parade of people migrating toward the show entrance, clusters of friends or colleagues reveal their cultural tendencies through dress. Each musical tribe is represented, from goth mopers, EDM lopers, country twangers, classic rock bangers, and surprisingly rare indie hipsters. Each of these attendees will have a different experience of the show (I heard a guy say into his phone “You’re here to work, and I’m just here to get wasted”), carefully calibrated to their creative and business needs. That said, in the year after the word “Selfie” was added to the dictionary, I thought the best way to depict NAMM was through a series of images of my excited visage blocking a day in the life of NAMM. 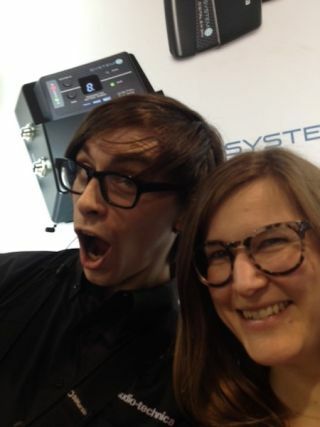 After the annual show-start press conferences at Harman (new rackmount version of the Soundcraft Si console; dbx Driverack PA 2 adds auto EQ and feedback suppression; watch for the newly acquired Duran Audio’s Intellibeam technology in upcoming JBL column arrays) and Electro-Voice (new ETX box for MI), my first selfie occurred at the Audio-Technica booth, where a very earnest young musician was demonstrating the new System 10 Pedalboard Wireless. He was having a lot of fun with the new stomp box, and aptly demonstrated the iconic guitar pose to exhibit his enthusiasm. The lines for badge pick-up on opening day were insanely long, like horribly long. Far worse than any year (or better if you want to brag about show attendance). Fortunately it was sunny out and quite warm, and I already had my badge. Two new food truck parks vastly improved the culinary options at the show. It was a huge relief to know one wouldn’t be stuck eating a plastic hamburger if one was pressed for time. Luckily, I do press meetings over lunch, and I enjoyed a quesadilla poolside at the Marriott with Mike Lohman of Shure, who informed me that big new steps are being taken in the spectrum auction space in coming months. Several microphone manufacturers are uniting their efforts in DC and will lobby together in a visit to the Capitol next month. Stay tuned to SCN for more details on the result. I also had a little more lunch with Paul Freudenberg, general manager of Rat Sound, who updated me on many new technology trends and shared philosophical insights about same. He’s also looking for more talent in Rat’s install division, so give him a call. Walking back to the exhibit hall, I did a shadow selfie. Escalators carried me upstairs to the demo rooms. The guy behind me enjoyed my selfie-taking humor. Roland Systems Group put on quite the integrated spectacle, which I had to show in multiple images. High-def Sony HDMI cameras captured a live band’s performance on Roland gear and fed SDI into new VR-3EX audio/video mixers, so attendees could create their own show using the cool touchpanel interface on this compact, feature-packed unit. Also, the guys behind the curtain at FOH were really nice when I dropped in for a selfie. Since I was upstairs already, I had to take some photos from the balcony and rooftop. It was snowing in New York, so I really had to get some palm tree images. I talked to some biker dudes on the rooftop about overpriced grilled cheese available at the concession stands there. Back at the Harman booth, my selfie took on a magical turn. As I pointed backward to the mobbed demo room (it’s always, always mobbed), I didn’t realize I was actually pointing to Paul Gallo, the founder and original publisher of Pro Sound News, and my very first boss and mentor. Shout out to Paul, who changed my life forever in 1998! Harman’s extraordinary PR team at Definition BAM escorted me through a series of meetings, including one with Harman general manager John Fitzgerald, who gave me some more details about how the pro audio division is sharing best practices with the automotive division for better product development and increased reliability. Then my former assistant editor and long-time friend Travis McGee and I got sentimental about Rolo candy at the front desk. This is a product selfie at QSC, where the new TouchMix compact digital mixer offered a “simple” option, which resembled me at this point because I was so thirsty and no one was offering water readily this year. Fortunately Dale Sandberg came to my rescue with some H20. Next up, a whirlwind tour with the superheroes of Clyne Media, who took me far and wide, into the wild and wooly terrain of the Arena, where the lights are dimmed and the “dance” technology goes crazy. Auralex Acoustics told me a bit about their new panels and then I got a selfie with a crazy mohawk dude. I wrapped up my day with a meeting at Riedel, where I learned a lot about how MediorNet and RockNet are being applied in houses of worship and stadiums all across the country by some of the AV industry’s biggest players. Then I had to get a selfie in front of the glorious LED fountain in front of the convention center. It was no Bellagio, but all the guitar noodling was replaced by the sound of the bagpipe parade that closes the show, so I was happy. I was rather self-less on Friday, so here’s an image of a green frou-frou drink that my friend Steve Johnson, the new CEO of Community Professional, said looked a lot like me. I’m an Americano drinker, actually, but he’s right, there’s a resemblance. Lots of good news coming out of Community, so stay tuned! Not pictured in the green frou-frou drink is the meeting I had with Steve Young of MUSIC Group/Behringer, which also has much news for our market this year. The new Midas M32 digital console is gonna rock your world! Then I met a metal band in line at the grilled cheese truck, but did not take a photo. But Scorpion and Eddie from Nekrogoblikon are my new best friends! I have to say that young musicians today are far more business minded than anyone realizes. I really enjoyed talking to them, and I hope they have fun on the metal cruise they just got booked on for this week! Also not pictured were my meeting with Renkus-Heinz – watch for special coverage of their installs and products in SCN’s March audio issue, along with highlights from many of the companies I’ve mentioned here. No time for a selfie because I was too busy being impressed by my demo room visit with Wesley Smith at PreSonus. She told me a lot more about the AI series of loudspeakers, which will bring a whole bunch of crazy new Dave Gunness/Fulcrum Acoustics designed features to the contractor market. Next up: wired and wireless networking! Last but definitely not least was my meeting with Pioneer’s new Pro Audio division, where I was privileged to be dwarfed by the gigantic new GS Wave Dance Stack. If you can’t tell from the elation of my selfie, I am actually quite the fan of electronic music, and I am so glad that Pioneer is helping to usher in the new wave of dance clubs that place less emphasis on bottle service and more focus on the actual music. Watch for my reports from the New York club scene next!All that said, NAMM was quite the show. As I do a bit of selfie-reflection, I know that I once again came away invigorated about the state of the audio industry. The market is demanding more custom-tailored products, and manufacturers are responding. So keep the conversation going! Call your favorite product manager or engineer today.